Our walnut is rich with grain features. This american hardwood is usually found in heirloom furniture and is still considered a modern treasure today. 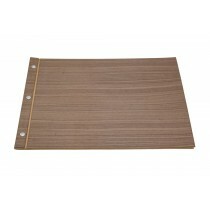 Our wood portfolios are durable, soft, flexible and amber in appearance. These books have "soft" hinges designed to lie flat when opened. A stiffer 1/16" version is available.